Netanyahu’s ability to stare down both the Palestinians and Obama made for another of those “there-goes-Palestine” moments. This is the third time that Obama has been steamrolled by Netanyahu. 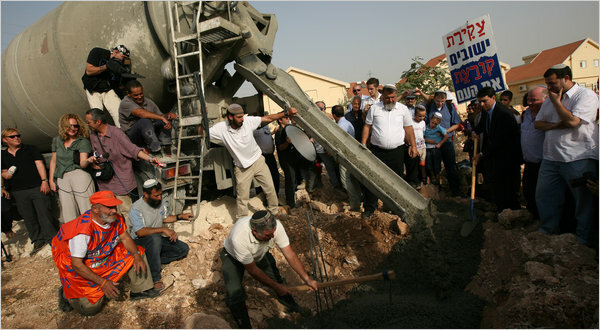 Jewish settlers in Kiryat Netafim poured a concrete cornerstone for a kindergarten on Sunday. JERUSALEM — Israel allowed a politically charged freeze on Jewish settlement building in the West Bank to expire on Sunday, but the Palestinians did not carry out a threat to quit peace negotiations, setting the stage for further frantic efforts to keep the talks alive. Al Hayat has learned that the meeting between Clinton and Al-Muallem was set up by US special envoy to the Middle East George Mitchell after his recent visit to Damascus. American sources were quoted in this respect as saying: “The visit made by Mitchell to Damascus was very positive. And upon his return to Washington, he informed Secretary Clinton about the results of his discussions, expressing his belief that there was hope of seeing the resumption of the Israeli-Syrian peace negotiations. He also informed the American officials about the importance of the Syrian role in the region, especially in regard to the ongoing peace talks.” A prominent American official also told Al-Hayat that the Obama Administration supported the resumption of Syrian-Israeli peace talks from the start. “The official added saying: “True, the Administration considers that priority should be given to the Israeli-Palestinian track since it is at the core of the problem, but it also supports the resumption of the Syrian-Israeli peace talks. And the fact that the Syrians have said that they were supportive of the resumption of those talks under Turkish auspice is a good thing… Washington expects the Syrian track to be reactivated within the few coming months.” In this respect, Arab diplomatic sources in Washington told Al-Hayat that they expected the Syrian track to become active again within the two coming months, although the American and Arab sources did not expect a solution to be reached on that track any time soon. Enhancing long-term strategic partnership among the four countries through establishing a high-level quartet meeting council. The ministers stressed that mechanism for regional cooperation will be open to friendly and sisterly countries. They appreciated the steps made by Turkey and Lebanon to reach a free trade zone agreement which will be a main factor for achieving the participation of the two countries. “…DAMASCUS, Syria — Palestinian rivals Hamas and Fatah announced Saturday that they have agreed on steps to end their division and share power and said they will hold more talks before signing a final deal in Cairo. The two sides have been bitterly divided since Hamas militants violently seized control of the Gaza Strip in 2007, leaving Western-backed Palestinian President Mahmoud Abbas of Fatah in control only of the West Bank…. The agreement came during a four-hour meeting that ended early Saturday between two delegations headed by Hamas’ exiled leader, Khaled Mashaal, and senior Fatah official Azzam al-Ahmed. A joint statement issued after the talks said the two sides have reached an understanding on “the majority of points of difference.” It gave no details, but the sides have differed over control of Palestinian security forces and the date for parliamentary and presidential elections. Hamas official Izzat Rashaq said the next meeting is expected during the first week of October. The two groups will then head to Cairo to sign a reconciliation agreement. That would clear the way for new Palestinian elections. U.S. Secretary of State is scheduled to meet Syrian foreign minister on Monday in New York to discuss possible renewal of Syria-Israel talks. A senior U.S. official said Friday that the United States saw Syria as an essential component in the path to achieving a comprehensive Middle East peace, ahead of a meeting between the U.S. and Syria, scheduled for Monday. “A comprehensive peace has to include the Syria-Israel track. It’s absolutely essential that Syria be part of this process,” Assistant Secretary of State for Near Eastern Affairs Jeff Feltman told reporters. “The fact that the Secretary [of State Hillary Clinton] is seeing [Syrian] Foreign Minister Walid Moallem on Monday, I think speaks for itself in terms of our commitment and our hope that now is the right time to move forward in trying to restart the Syria-Israel track,” Feltman added. Meanwhile, Clinton met with Palestinian President Mahmoud Abbas on Friday as the Obama administration engaged in furious, last-minute diplomacy to prevent Israeli-Palestinian peace talks from collapsing when the temporary settlement construction freeze ends on Sunday. Feltman told reporters the U.S. is urging Israel to extend the moratorium and that both parties need to see the negotiations through to their conclusion. “Three PKK members were arrested in Beyrout by Lebanon security forces. The operation against so-called Israeli spies still continues.During the last week, Lebanon Military Intelligence Service launched operations against the ‘spies of Israel’ in Jonieh, a coastal city 20 kilometers north of Beyrout. During the operation, 3 PKK members were also caught. Interrogated terrorists were put under arrest for spying for Israel in Lebanon. The Syrian Government has increased the retail price of fuel oil to SYP 8,500 per ton in line with its target to reach market rates by 2015. Nexia International, an international network of audit and consultancy firms, has opened a branch in Syria. We are proud to be Yehudi-Arabi. It is in our veins’. Many Syria’s Jews who never saw their home country have not lost touch with their roots. This statement might be truer for the Syrian Jews than for almost any other immigrant community in the world. …. For three decades, the writer and journalist Gideon Levy has been a lone voice, telling his readers the truth about what goes on in the Occupied Territories. He says Netanyahu has – like the supposedly more left-wing alternatives, Ehud Barak and Tzipip Livni – always opposed real peace talks, and even privately bragged about destroying the Oslo process. arab culture is superior except to those arabs so brainwashed by western institutions and programs of propaganda. another example of a fascist police state. from ron jacobs. mr jacobs places this thuggish action in amurderka but we all know this occurs only in non-democratic syria. cant remember what i wrote but i do bash jewry every chance i get. if i say jews i mean “the jews”, the organised power structure that controls congress, white house, wall st, media, what we can and cannot say. i also go after individual jews who are, in my reading, weasels eg few who post here. I beg to differ with the “there-goes-Palestine” moment. In fact, I would argue that Abu Mazen should, very calmly, suggest to Netanyahu that renewed settlement activity is simply a continuation of the “there-goes-two-states” saga. It is Israel that should hope to get the Palestinians to agree to an End of Occupation, not the other way around! Iran, Lebanon and the Arab-Israeli dispute. Euphrates River before Israeli jets bombed the site in 2007.
in the Palestinian territories and Hezbollah in Lebanon. is ours. And it’s not up for negotiation,” Mr. Moallem said. Lebanon remains an issue of tension between Washington and Damascus. The U.S.
investigation to ensure fair treatment. Gideon Levy gave a bleak account of the state of Israel during his conference in Montreal. He said that Israel is a country in a coma. Israelis, busy in acquiring real estate and making money have totally lost any interest in the people they are oppressing and the land they are illegally occupied. He was very depressed at the loss of moral values and the brainwashing done to Israelis. He did not see any hope of waking the Israelis from their coma except by increased events that could put international pressure on them: like the flotilla and the Goldstone report. But ultimately he sounded very pessimistic. Remember that it is traditionally the Left in Israel that goes to war, not the Right. It is Begin that gave back the Sinai, Netanyahu that gave back control of major cities in the West Bank to the PA (in Arafat’s days), and it is Sharon that withdrew from Gaza and was going to continue in the West Bank. Both Sharon and Olmert were elected specifically on the platform of withdrawal from the West Bank. All Likud members and leaders! Netanyahu knows he doesn’t need to go to war – he has the Left to do that for him. I would guess he’s far more interested in finding a way to deliver the final Arab-Israeli Peace, than the next Arab-Israeli war. He could still go down in History as “the man” to do that. But he has very real problems delivering this (assuming I’m right), because his coalition is made up of weak and paranoid ostriches, who’d rather do nothing. That Clinton finally sat with Mouallem is a very good sign. I don’t think it’s about “luring” Syria. Syria’s stance vis-a-vis Iran, Turkey, even Hezbollah and Hamas, has already proven that it can’t be “lured” so easily. I’m sure Feltman has made it abundantly clear in the State Department that Syria will not play ball without a guarantee on the Golan. I’m sure Netanyahu also knows this. It is not a matter of Right or Left , it is a matter of justification to seek a settlement and as long as the Israeli not suffering from the present status it will be difficult if not impossible for any prime minster to seek a solution to a problem that only the Palestinians feel , Don’t you think , ? The WSJ report covered in your comment 6 addresses a list of serious issues. By virtue of HA, Hamas, Iraq, Syria, Houthis, Bahrain and Kuwait and Saudia’s badly treated Shi’ites, Tehran has become a part of the Israel/Arab landscape. Under current geo-political and religious/ sectarian realities in the Middle East it would be practically impossible to disentangle this web. The Bush/ Cheney/ Blair failed project in Iraq handed Tehran regional dominance on a silver platter without Tehran firing a shot. Today, in the absence of Tehran there can be no peace prospects on the shores of the Eastern Mediterranean. Iran has become a part of any solution there. Tehran must be brought by Washington into the negotiations and the bargaining. Iran has its own agenda and will not cooperate for nothing. Chances for a successful settlement of the disputes are close to zero. Meanwhile, GCC royals must be having nightmares. As you know, I fear that you may be right. But it is very difficult for me to explain to you how a people can exist in a state of coma, apathy, arrogance, fear and paranoia, all at the same time… While Syria is (presumably) no match for a classic military battle with Israel, it is certainly a far more dangerous rival (perceived and real) than the Palestinians. Using your logic, Israel should opt for peace with Syria far sooner and more urgently than with the Palestinians, especially nowadays, when almost zero incidents of Palestinian terrorism/resistance take place. And, unlike Abu Mazen, Syria can deliver. So I’m not sure we must have another war over the Golan. However, you may still be proven right. The realitIes no one seems to accept. Israel is the sole entity that still dictates in 2010 whether a Palestinian State becomes a reality or not. Israel still occupies the Golan Heights. Israel still determines whom the US considers an ally or enemy in the Middle East. American Jews for the most part are dedicated to condemning ALL ARABS/MUSLIMS. The overriding posit then translates into what happens from now on. Making a peace deal with Syria will have to take into account Iran. Israel will not make a peace with Syria unless it is sure that Iran is neutralized and/or evacuated from Syria and other arab countriesi. This is a hard task for the US administration considering the way the relations have envenimated, mostly thanks to Israel who thought that this would ‘isolate’ and strangle Iran. The result is that isolation and rejection from the west has made Iran closer geographically with Israel with Iran’s alliances with Lebanon Iraq and Syria. If Israel wants peace with Syria, they will have to become less aggressive towards Iran and in view of the present political stand in Israel this seems far fetched. Yet, a real gesture from Israel towards Syria may create a momentum for unravelling all these knots, including containing Iran, and create an impetus for a change of attitude of Syria allies towards Israel. A withdrawal from the Golan will not be like Gaza. Syria had good control of its border with Israel. It is time the US wake up and takes seriously the primordial task of pushing Israel to return the Golan and cancelling the sanctions. “With the resumption of settlement construction in the West Bank yesterday, Israel’s powerful settler movement hopes that it has scuttled peace talks with the Palestinians. beneficiaries, including several posting here, who live well on someone else’s land and with someone else’s money. god bless the welfare bums amongst us. to following paragraph from above, add: julan heights after w. bank and gaza. remember dayan said, “we took the julan out of greed”. dayan, what hasnt israel taken out of greed. But the problem—or at least a crucial problem—is settlements. Creating a contiguous Palestinian state in the West Bank could easily require moving 100,000 settlers—ten times as many as Israel removed in Gaza, on far more theologically charged land. All those settlers will have to be financially compensated (at least partially, judging from the Oslo discussions, with U.S. taxpayer dollars). Many will have to be violently confronted, a terrifying prospect given that militant settlers comprise a larger and larger share of the Israeli officer corps. (Yitzhak Rabin, remember, was assassinated for merely contemplating the removal of West Bank settlements). And even if all this can be done without civil war, any land Israel keeps in the West Bank will likely have to be traded for land within pre-1967 Israel, and there’s not much land to trade. problem moving 100,000 squats? jews had no problem moving, killing 1,000,000 palestinians. financially compensated for stealing. how about hanging. I hope we are seeing these signs. However, with regards to Iran, I don’t think Israel will demand Syria “flip”, as everyone seems to suggest it will (and the U.S.) And this is simply because Syria will not agree. What Syria probably will agree to, I imagine, is completely changing its military/defensive stance and alliance vis-a-vis Iran. Syria won’t need a military alliance with Iran once there’s peace in the region, and once the Golan is returned. If such an alliance threatens Israel, as today it does, then I’m sure Syria will be ready to change the nature of such a relationship, without harming the diplomatic, economic, cultural, etc. natures of her relationship with Iran. I believe Israel and the U.S. can and will accept that. I disagree with you about Israeli aggression towards Iran. While it is true that Israel has repeatedly sent threatening messages of the “all-the-options-are-on-the-table” nature, I doubt most in the world would view Israel as the aggressor, and Iran the receiver. I imagine most, including the Arab World, have adopted deep suspicion of Iran’s objectives vis-a-vis the region, and even vis-a-vis Israel. Israel has never called for the destruction of Iran. Iran, as you know, hasn’t missed a week in recent years to do so. And no, I don’t buy the soft-translation, suggesting Ahmadinejad only means the “Zionist Government”. Having said that, I’m one that believes Iran does NOT pose an existential threat towards Israel, and that therefore it would be wrong of Israel (or the U.S.) to ever attack it. Israel is still far stronger than Iran, and should maintain its deterrence instead of practice its might. Now if Iran falls then the geopolitics will be changed and that is what the US and Isreal have fail to achieve. This is why i believe that Israel has to stop attacking and threatening Iran and the US stop demonizing it then we may see a relaxation of the verbal provocations and an opening to dialog. While Ahmadinejad has threatened Israel, it does not reflect the views of the iranian establishment the same way as your leaders have threatened to reduce Lebanon to the age of stone. These are just verbal provocations in respond to the military and political provocations Israel and the US continue to inflict to Iran and its allies. Iran’s history has not been one of aggression while Israel’s history is only aggression. Israel must mend its relation with Iran by using another strategy than aggression. To do that it has to stop misleading the US in their stand with Iran then court and please Syria so it uses its influences on Iran, once the Golan is returned. But Israel is far too used to solving their problem by aggression and wars to move into quiet diplomacy. The US is the key, nothing else. Interesting turn of the issue. Netanyahu still rules. Discussion is centered on Israel/Iran while the pivotal issue is whether the Palestinian Arabs have as much rights and are as important as the Jewish settlers from Moldavia and other exotic countries to their own state? An individual has to question whether this 50 years charade of a road to peace is based on the fact that the Arabs [excepting Syria] are mentally retarded or being bribed to go along with the Zionists. If they are being bribed then the least they could to is demand as much money as Israel gets from the US yearly. If its not that then as the saying goes” forget about it”. Can you support this claim? I disagree that even today the question is whether the Palestinians have a right to a state. I doubt there’s a single nation on this planet, including all of Israel’s allies, that question this right. The only “question” that remains, which most nations don’t seem to be capable of answering, is whether they have a right to a separate state, or a single state with the Jews. I do agree with you, however, that the world can certainly do much more to “force” one of those two solutions. Formally recognizing a Palestine, whether with specific borders or not, is one way to start. I imagine this will occur sooner or later, if your so-called “50 year charade” (probably viewed more as a 17 year charade, since Oslo), continues. A witness in court today accused the Islamic Center of Murfreesboro’s leaders, including Imam Ossama Bahloul, of being supporters of Sharia law. The Murfreesboro Tennessee mosque ‘debate’ (see here, here and here) continues with the opposition breaking out one of the ‘big guns’ of the zionist neocon ‘clash of civilizations’ permanent war ‘us vs. them’ psychological warfare operation. None other than Frank Gaffney Jr.; Israel first, anti-American think tanker, media whore and hate shill for elitist fun and profit. Someone backing the plaintiffs suing Rutherford County to stop the government from issuing any more building permits to allow the Muslim congregation from building a larger community center with a mosque gets Gaffney to ‘testify.’ It was a desperate move because the locals they hired to file the lawsuit are a bunch of screw up self promoters. So it’s call in the jewish self proclaimed Muslim ‘expert’ to give the talking points an air of authority. One of the original Project for a New American Century signatories for Rebuilding America’s Defenses who got his ‘new Pearl Harbor’ and wars with Afghanistan and Iraq and beyond. That’s enough, you get the picture. I do like the idea of Gaffney on the witness stand but with him on trial for his life. He should have to testify as to his lies, his criminal accomplices and bosses, his treason to this country and his contributions/complicity to the murder of thousands of Americans on 9/11 and in illegal wars. He has the blood of a million plus Muslims on his hands. May justice one day prevail. Surely you don’t believe this Neocon Gaffney Jr. is representative of most American Jews, do you? You must be a Newt Gingrich fan since he believes that Obama is a “closet Muslim”. Your comebacks SHAI are akin to handling a slippery eel. I disagree with you about Israeli aggression towards Iran. While it is true that Israel has repeatedly sent threatening messages of the “all-the-options-are-on-the-table” nature, I doubt most in the world would view Israel as the aggressor, and Iran the receiver. I imagine most, including the Arab World, have adopted deep suspicion of Iran’s objectives vis-a-vis the region, and even vis-a-vis Israel. Israel has never called for the destruction of Iran. Iran, as you know, hasn’t missed a week in recent years to do so. Shai can you show where Iran has called for the destruction of Israel? It should be no problem because you say it has happened weekly. Saying that the Zionist government should be erased from the “pages of history” is a bit different than demanding to use nukes and armies against Israeli Jewish population and committing a new holocaust. By the way Israel’s and USA’s regimes have publicly for decades “wished” that the “Ayatollah” regime vanishes and the nice “Shah” returns. Israeli experts have even discussed about using nuclear weapons against Iran. If some military analyst claims that the Iranian army is in reality equipped for expansive operations and materially ready to invade the neighbourhood he does it because he is paid to say so. Not because he believes that. Compare for example the military resources of Iran and Saudi Arabia, or Iran and Pakistan, or Iran and Turkey, or Iran and Russia. It would take decades and countless billions that Iran would be militarily enough strong to invade the neighbours. Own nukes would give Iran only a much more greater immunity against foreign attacks and political pressure, not a real invading capacity. So the notion that the Arab neighbours are afraid of Iran’s military capacity and aims is pure Israeli/American propaganda. The leaders of Arab countries loyal to the “West” are afraid of what Iran could and probably will become. The regions leading scientific, financial and industrial power which can control the shipping route and be a leading member of the really functioning energy cartel. The fear of Iran is not a military fear, it is purely a political fear. A successful Iran will challenge the present style Arab regimes and the contrast in success and achievements becomes to big. Of course Shai most of the world sees Israel and USA as the aggressors. The US/Israeli line in IAEA, do not dare to speak about the Israeli nukes but you are demanded to speak about the Iranian potential “nukes”, succeeded only partly and probably only because of massive US political and economical blackmail towards the member states. On the next round that will not succeed. The US/Israeli nuclear policy is so absurd that it can’t kept “alive” long. Either Israel is disarmed of nukes or the neighbourhood will create nukes. Turkey for example will have really to consider its options. It has to neutralize the Israeli nuclear threat and the chaos Israel is spreading around. And it has to do that relatively fast. The Israeli demand that no Arab country is allowed to begin to use peaceful nuclear technology is rather absurd. These potential nuclear reactors represent such economical and commercial interests to the leading industrial powers that Israel hardly can any longer block the development. It is absurd that USA demands Jordan to give control of the uranium ore found in Jordan to Israel. Control to a nation which doesn’t have civil nuclear energy production and has not signed the NTP. Dancing Shlomos and others of similar inclination. As much as I despise the writings and opinions of people like AP and AIG on the other side, I have to say that I find your tone, language, and attitudes arrogant and despicable. I see little substance, and a whole lot of self serving, self assuring, boasting, and totally unfounded arrogance in a lot of what you write. “Arab culture is superior” is it, DS? I think we can use a little more modesty and a little less boasting, and I don’t want to start counting the many shortcomings that this “Arab Culture” suffers from. I am a Muslim and an Arab (100% Arab lineage too), and I think we’ve used up all the boasting we can muster and should accept that we will be building from scratch if we really want to accomplish anything. My gut feeling is that the 5 Dancing Shlomo commentor is neither an Arab or a Muslim. There have been many instances where “non-arabs/muslims” have interposed themselves in commentaries just for the sole purpose of degrading Arabs and Muslims. See #22 above. Dear Averroes, Thank you for your wise words. Is is a shame to be dragged into needless name calling and strutting about. Arabs have killed orders of magnitude more Muslims than Jews have. Which websites do you use to complain about the Arab murderers? Comparing the number of those killed by Israelis to those killed by Arabs/Muslims is a pathetic argument used over and over by many Israelis and neocons. Even with that comparison, one has to take into account the large difference in the exposure area, i.e. the number of the populations in conflict with each other. So, with 1.4 billion Muslims worldwide, areas of conflict and the number of people in conflict may be large in sheer numbers, but percentage wise, it is a fraction of the killing produced by Israel. In other words, Israel produces more killing and terrorizing per capita than any Arab or Muslim country in the world. If Arab and Muslim countries were to match you with that statistic, the victims would have to be in the tens of millions, which they are not, not by any far measure. In fact, if we were to look closer, we would find that most of the killing produced by Arabs and Muslims against one another (the case you’re boasting about) is made by extremist elements like Al-Qaeda. What do you know? There is a match for you in the Arab world. Your approach is deeply flawed, and on many levels, so I suggest you stop using it. No wrong on the other side can justify a wrong on your own side. No Israeli thinks he’s living “in peace”. Four years ago a small group of a couple thousand combatants (as opposed to a large army of hundreds of thousands), held a million Israelis underground for 34 days. Rockets fell on every corner of our Northern part of the country. And it was just Hezbollah, not the armies of Syria, Iran, Iraq, etc. Hence the contradictions I suggested earlier – apathy, arrogance, and yet fear and paranoia. While Lieberman is leading the 3rd largest political party in Israel, he is still far from representative of the average Israeli. His rhetoric is extreme, and even the Prime Minister’s Office tends to go out of its way to make clear its disapproval of his statements. Everyone on Israeli media is calling on Netanyahu to fire Lieberman. If he was representing the average Israeli, the media would only support him. I imagine Netanyahu is still holding on to him, in order to show his own coalition what “the alternative” is. I.e., if you don’t support me, and we go to Elections, you may have to work with this guy next time around. AP’s argument is similar to AIG’s “The Palestinians are better off economically than the rest of the Arab world…” I like to compare that to a theoretical counter-argument to Racism in the South, by suggesting African-Americans still earn far more than their Liberian ancestors… Btw, the per-capita argument is brilliant! The following extract is more than ample corroboration to what AVERROES stated under #31 above. To these we could add “sofa slaughter” with armed drones. The Israelis use this armchair technique extensively in Gaza, unleashing death and destruction on civilians by remote control at no personal risk to themselves. There are interesting variations too. For example, during the 40-day siege of the Church of the Nativity in Bethlehem in 2002 the Israeli occupation force set up cranes on which were mounted robotic machine guns under video control. According to eye-witnesses, eight defenders, including the bell-ringer, were murdered, some by armchair button-pushers and some by regular snipers. In other words, Israel produces more killing and terrorizing per capita than any arab or muslim country in the world. I see you suffer from the same brainwashing as our form anti-semite, 5 dancing shlomos. So if sheer numbers isn’t enough reason to start your own anti-arab website, “per capita” statistics are? So yes, please provide your data and make sure you include Lebanon, Turkey, Iraq, Iran, and Syria, as these are all Muslim countries. Oh, and when you start your new website, I’ll be happy to write the first post. In Sun Tzu’s “Art of War”, use of chemical warfare was advised. I’m sure that’s part of the reason France and Germany didn’t mind using it against one another in WWI, the British in repressive bombardments against major cities in Iraq (under its control), the Bolsheviks in 1921, the Spanish and French in Morocco during the Berber rebellion, Italy in Ethiopia, the Japanese in Manchuria, and of course Nazi Germany and the USSR. All this, long before “The Zionists” began developing our own forms of weapons of mass destruction. Before your 2001 “very likely use” of nerve gas by Zionists in Gaza and the West Bank, you forgot to mention the “very real use” of gas by non-Zionist Egyptian forces in North Yemen, in 1966-67. Or Iraq’s use of mustard and nerve gas against Iran starting in 1980, all throughout the 8 year war (more than 100,000 dead just from gas), and ending in 1988 with the horrific attack on the Kurdish village of Halabja. So I don’t know who gets the extra bonus points for introducing WMD’s to the region, but please do not try to suggest the Arabs have “clean hands” when it comes to actual use of WMD’s. Thank you. I’m just sick of people using cheap and morally corrupt arguments to defend state terrorism. Have I touched a nerve here? prompting you bring up the anti-semitism, brain washing, and the similar WMDs. Syria Comment is not an anti Israel web site like you would have us believe. Further, many people here spend quite a bit of effort condemning acts of terrorism that are committed by Arab and Muslim fundamentalists and other crazies. There are 1.4 billion Muslims including Arabs in the world. How much inter-killing have they produced in the last 100 years? How many wars have they started against other nations and peoples compared to their populations? True, there has been crimes and I’m not in any way defending those, but what I’m saying is if we were to adopt Israeli standards, the numbers would be much, much larger. During the two World Wars, Europeans killed more of each another than any other race in history. During the American Civil War, Americans killed more of each other more than any other war they fought before and since, including the two WWs. How can you use such unfortunate historical facts, in any contest, to justify racism, systematic discrimination and humiliation of an entire people? I’ve also heard many times, the exact other face of your argument being used over and over by Israeli commentators and politicians when addressing Americans in particular. “We lost 200 people in this war … that’s the equivalent of the US losing 12,000 people”. What a sickening way of intimidation and extorsion that your politicians use every day to justify their crimes. This is what you’re doing with that argument: trying to justify the unjustifiable. Ghat, thank you for this valuable list of facts and figures. Simohurtta’s #25 was absolutely correct about Iran’s military limitations, nukes or no nukes. Iran is not, and will not become, any sort of “dominant power” in the region. The worst that could happen if Iran acquires some nuclear weapons is that Israel would lose its currently almost unlimited power to stage spontaneous attacks on its neighbours, because they would have to become more wary of potential escalation than they are now. However, if the Iranians succeed in pursuing an independent line of policy, they would certainly embarrass the Saudi and Egyptian gov’ts in the eyes of their respective publics. i think you mean well but are way off. what culture doesnt suffer from many shortcomings. they are all human. but what is the measuring stick for perfection from which shortcomings are gotten. one measure of superiority of arab culture to western is the lack of invading every country in the world and the resultant devolution, destruction of the invaded culture. another is the constant harping of superiorty(by the west/isr) and the concomitant declarations of inferiority of the other also by the west/isr. arabs, mujslims dont seem to engage in this sort of child’s activity that so engages western, israeli intellectuals and parroted by their respective streets. many of my posts are addressed to those who bash syria, arabs, muslims while ignoring equal and worse faults in their idols where they aspire to live. and for ignoring the tremendous pressures, influences, interferences that prevent normal evolution within arab, muslim countries. hey, i havent been deleted – yet. i’ll add another comment before i give up this computer for 4-5 days. how can s. arabia, all the gulf states, jordan, just to name these few, change when u.s. will not permit except for chan ges benefiting america and israel. changes benefiting america and israel. What Does a “One State Solution” Really Mean?